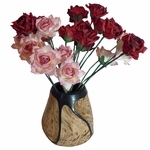 Each original vase comes with a pair of strikingly realistic paper roses. 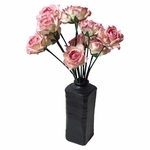 These subtle paper roses were chosen in colors to accent our uniquely designed bud vases. 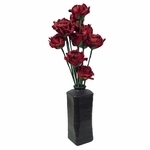 A beautiful gift that will be remembered! 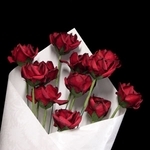 Fresh flowers are lovely, but they don't last long... 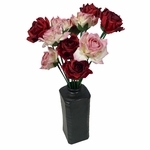 These combinations of unique glass vases and lovely paper roses solve the problem. 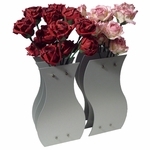 Use them with paper roses during the winter, and with a fresh cut flowers in the summer. Perfect for Wedding Anniversary Gifts... First Anniversary is 'Paper' so it's especially meaningful for the 1st. 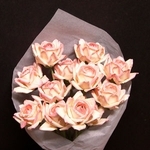 And if you simply want a dozen, paper flowers, we offer that too!